Most of the chaos – if not all – happens because of this information broker. Word got out that you’re the founder of a gang? Probably Izaya. Random bartender running down the street, throwing lampposts and vending machines? Oh yeah, that’s definitely Izaya’s doing. Izaya tells you he knows about your missing head but not its location? He’s lying, and more than likely has it encased in a jar. 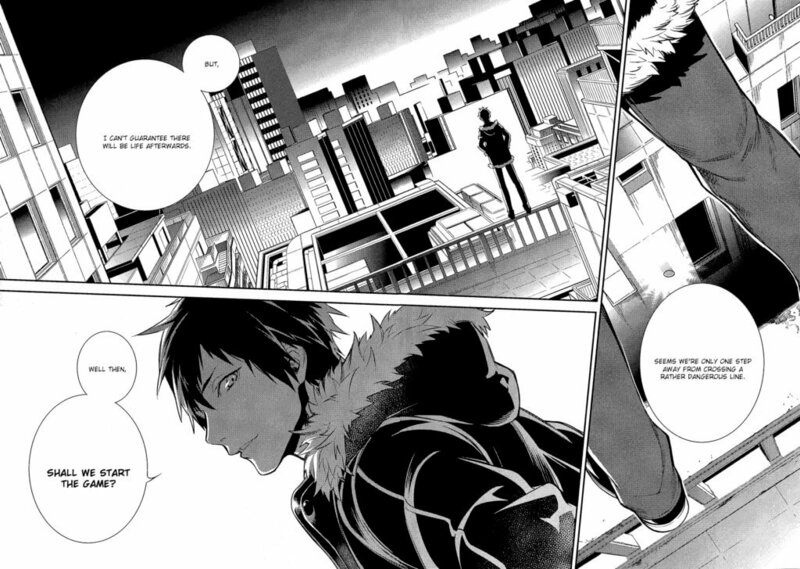 So, from the second I opened the manga and stumbled upon Izaya flipping a coin right smack dab at the beginning, I knew things weren’t yet settled in Ikebukuro. Durarara’s cast is quite extensive. The main recurring characters, of course, are very memorable. However, since there are so many main characters, readers might have a hard time remembering secondary characters. After the first few pages with Izaya, the scene jumps to a secondary character, Chikage Rokujou, who is always surrounded by women. That trait alone makes him unique, but his backstory could be forgotten, especially for people who have not read the series in a while. The good thing, though, is that the story gives you a small reminder about him without sounding too forceful. The dialogue also comes out organically, with strong hints that’ll help you recall scenes from the previous arc. 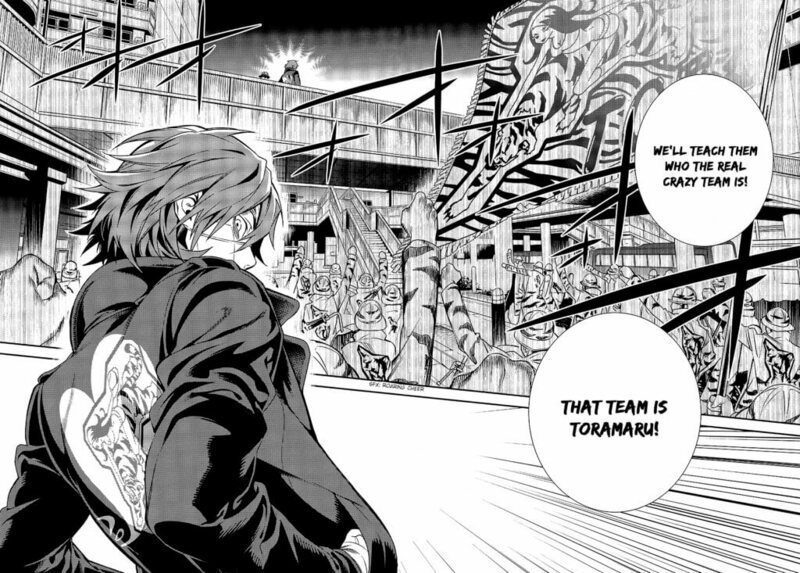 Shizuo is back to living the irony of wanting peace, yet always finding his way into a brawl. People still pick fights with Shizuo? Yes, people with a death wish. This time, though, a little girl tases him with the intent to kill. Another great thing about Durarara is the way new characters are introduced. Like in the previous arcs, Durarara has a compelling way of connecting every character together – even when you think there might not be any connection. The little girl who tases Shizuo is the daughter of a Yakuza boss syndicate, whom Celty is working for to locate a missing person. Vorona, a newcomer character, is introduced as a Russian hitwoman. She is sent to eliminate Celty to prevent her from locating the yakuza’s person of interest. An additional newcomer, Aoba, introduces himself as a classmate to the Dollar’s leader, Ryuugamine. He reveals his knowledge towards Ryuugamine’s past, and that he’s also causing disturbances with other gangs in hopes of getting the Dollars fortified as a gang. In the end Izaya orchestrates most of these connections. How and why? The end of the volume gives you a satisfying conclusion that’ll leave you wondering, at least until you get your hands on the next volume/chapter. Remember when I wrote how characters can get a little mixed up? 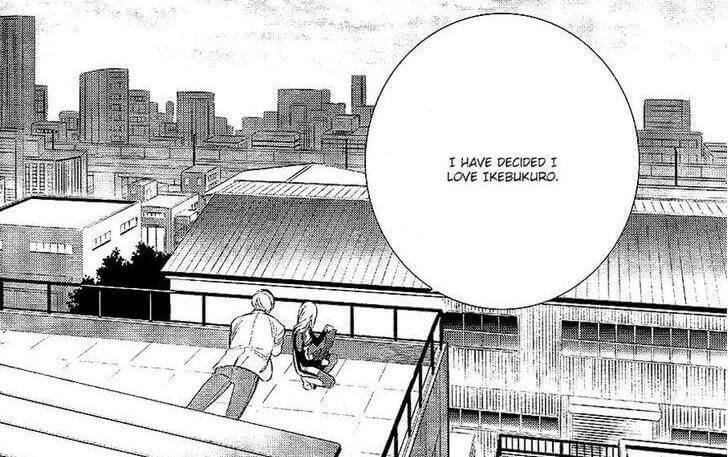 While it’s good the manga gives us reminders, it’s a little hard to keep up in the Dollars group chat. In past arcs, it’s been revealed which username belongs to whom. However, that small detail is not present in this new arc, instead choosing to only show us usernames in the chat. So far the only ones revealed are those of Masaomi (former leader of the Yellow Scarves), Izaya’s, and Ryuugamine (since the group chat is viewed from his perspective). Not much else seems to be out of place here. There hasn’t been much explanation about the two new Russian characters, Vorona and Slon, but it is quite possible they might have a connection to Simon, the Russian sushi chef. It’s exciting to see my favorite characters back and getting themselves into crazy shenanigans. The Yellow Scarves Arc manga had a different artist, Akiyo Satorigi. The art was really quirky and enjoyable. However in this Dollars Arc manga, Aogiri (the current artist) made me fall in love. Aogiri depicts the characters with more detail and closeness to the look of the anime adaptation. The story flowed exceptionally within each panel, and it was all neatly organized. I am also looking forward to learning more about the new characters from Russia. Like most people in Ikebukuro, the people we follow have special traits that make them unique and memorable. Vorona’s dark backstory of committing murder as a child sort of makes her fit in with the cast. Especially since she considers herself a monster, which – let’s face it – I can’t help but wonder who isn’t in some shape or form at this point. Lastly, I am very excited about Ryuugamine’s arc. His character has always been a little awkward yet courageous, but it constantly felt like he was hiding more. With his last appearance in this volume, one can only assume he will reveal his true self soon. What will that be? I’m not quite sure, but I’m curious to find out. You can read more about Durarara on Anime-Planet and order the volume on Amazon. Special thank you to Yen Press for giving us the opportunity to review this manga. I'm a Puerto Rican writer and a stationary hoarder. You can find me with my nose stuck in a book or burning my fingers with the hot-glue gun as I work on cosplays. My goal in life is to publish young adult novels for diverse audiences.